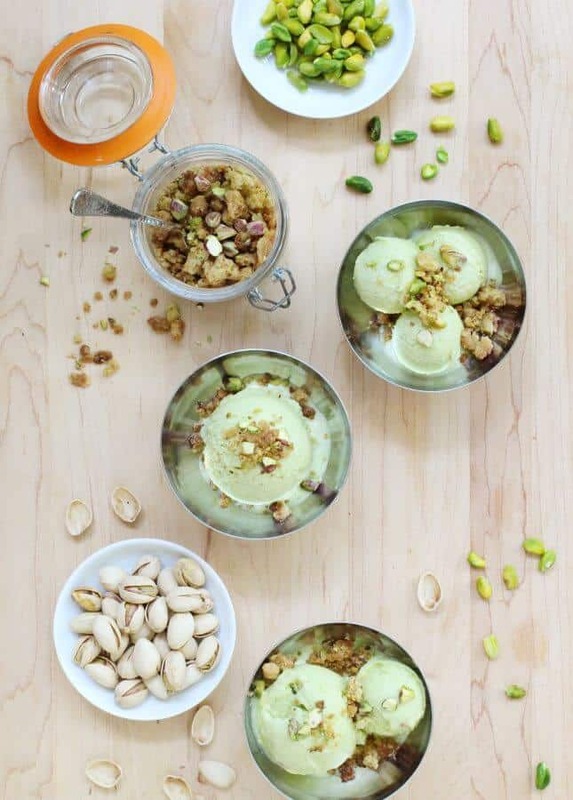 Is it gelato season yet? In my house, we love the iced treat so much that we enjoy it year-round, even in the heart of winter, although I like to rotate flavors according to seasons. 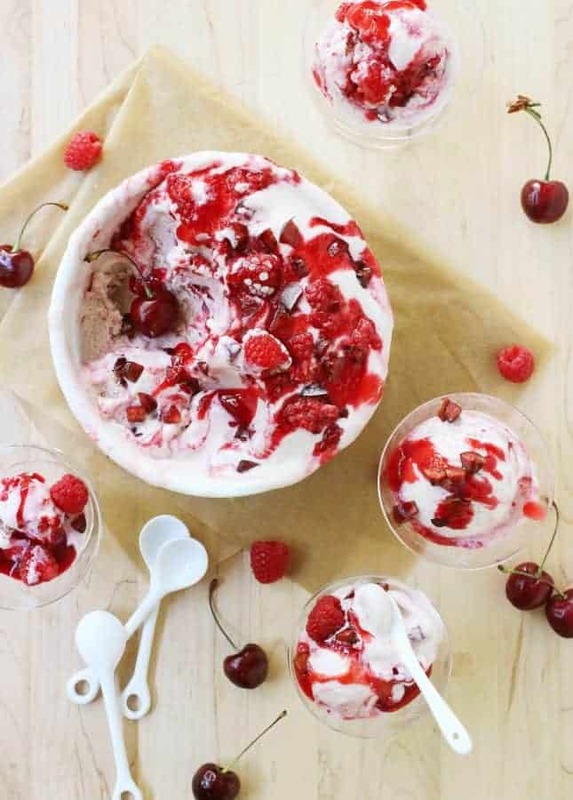 Dark Chocolate Gelato is perfect for cold nights—especially served with an Italian digestif, such as Vin Santo—while Cherry and Raspberry Ripple Gelato sings of summer. 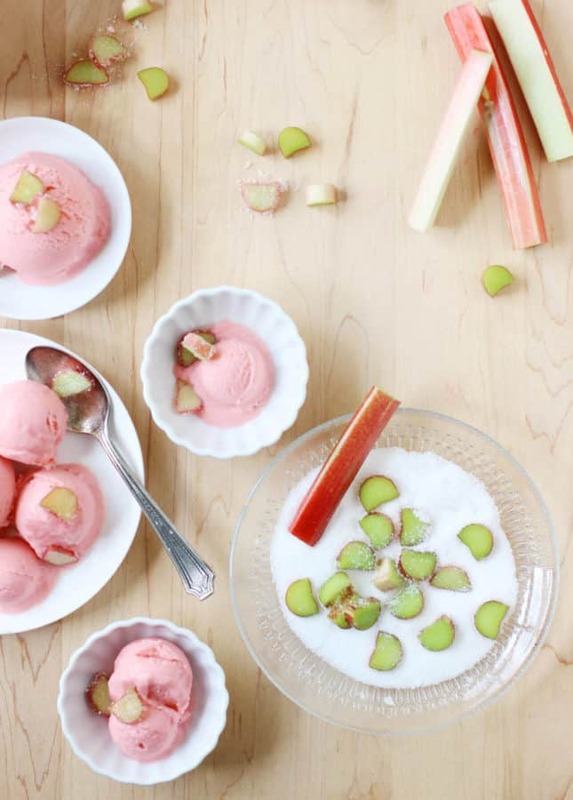 In the spring, I always make a point of churning a batch of this blush pink Rhubarb Gelato. 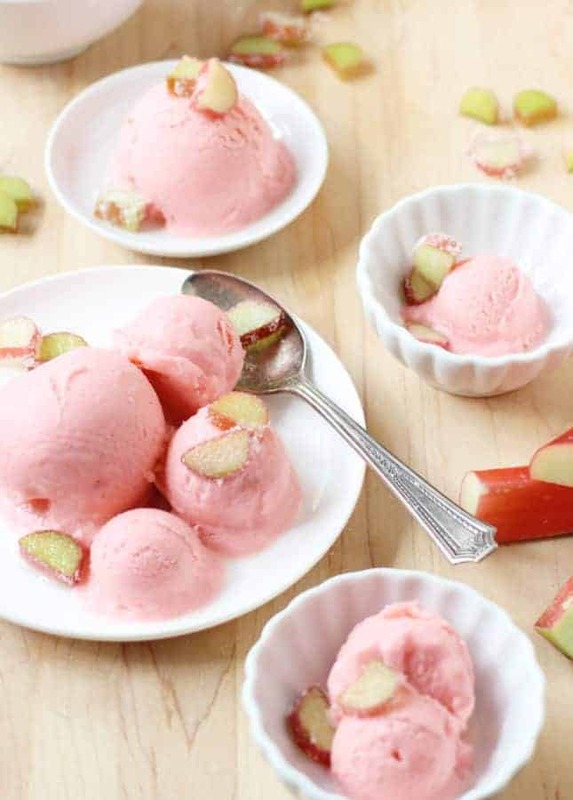 The bright, tart flavor of rhubarb is balanced by the silky smoothness of the Sicilian-style vanilla gelato base, while a hint of orange rounds things off perfectly. It’s a memorable springtime treat, one that, to me, rhymes with good things to come. Serving note: Because I always like to serve gelato with a crunchy topping, I thought it would be nice to sprinkle this Rhubarb Gelato with sugar-coated fresh rhubarb pieces. It’s another sweet reminder of a childhood memory (eating sugar-coated rhubarb stalks on hot summer days–life was so easy back then! ), and a wonderful way to enjoy seasonal produce at its freshest. Makes 1 quart (1 L). 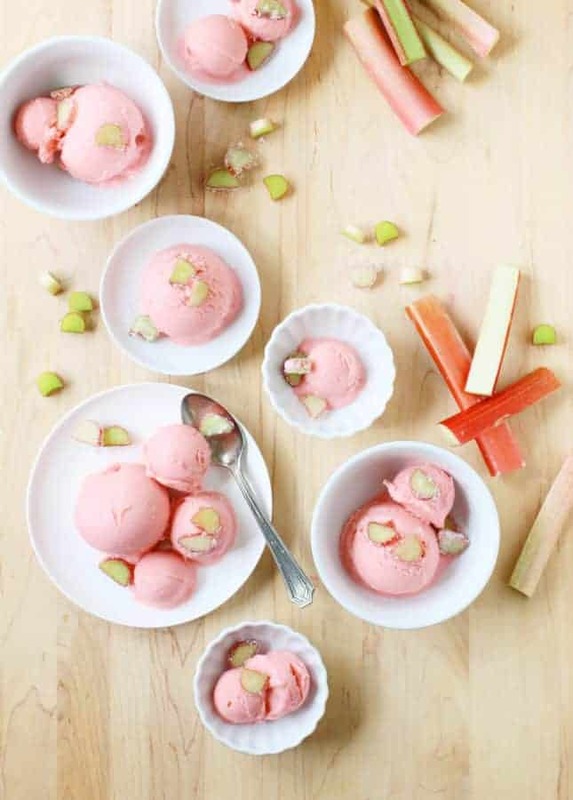 In this blush pink Rhubarb Gelato, the bright flavor of rhubarb is balanced by the silky rich Sicilian-style vanilla gelato base. A memorable spring treat! Make the rhubarb compote: In a saucepan, combine the rhubarb, sugar, orange juice and zest, Cointreau or Grand-Marnier (if using), and vanilla bean. Bring to a boil, lower the heat, and simmer, stirring from time to time, until the rhubarb is very soft, about 10 minutes. Remove from the heat. 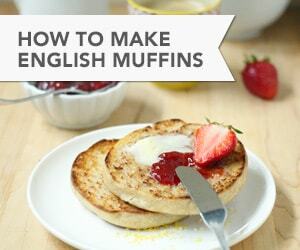 Blend to a very smooth consistency using a stand blender or stick blender. 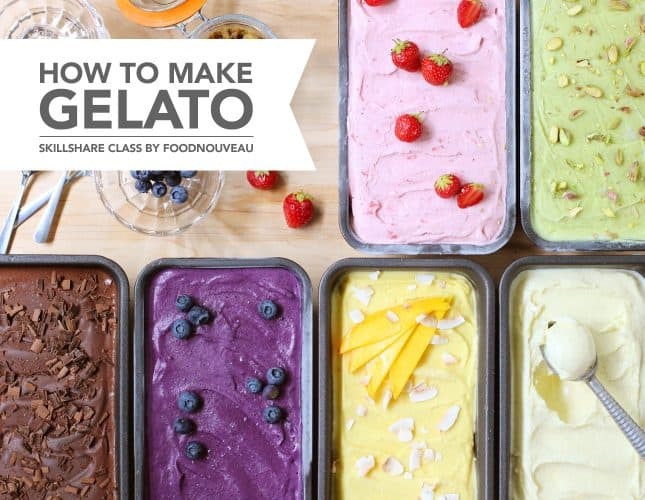 Let cool at room temperature while you prepare the gelato base. 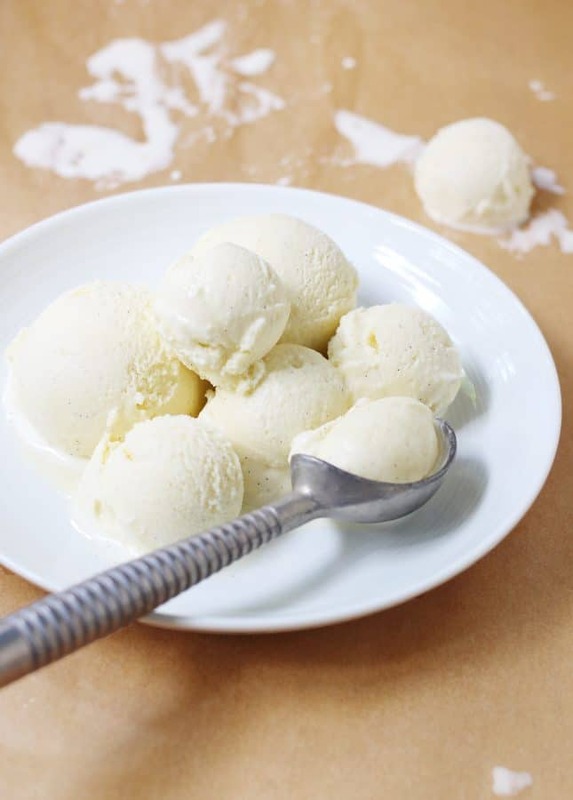 Make the gelato base: In a saucepan, pour 1¼ cups (310 ml) of the milk and the cream. Warm over medium heat until it just starts to bubble around the edge (no need to bring it to a boil). Meanwhile, in a small bowl, whisk the remaining 1 cup (250 ml) milk, sugar, and cornstarch together. Remove the saucepan with the hot milk from the heat and whisk in the cornstarch mixture. Return the saucepan to medium heat and cook, stirring regularly, until the sugar is dissolved and the mixture thickens slightly, about 6 to 8 minutes. Place the egg yolk in a medium bowl and whisk until it is pale and slightly thickened, about 1 minute. Temper the egg yolk by slowly pouring one ladleful of the hot milk mixture into the yolk, whisking constantly, then slowly pour the egg yolk mixture back into the saucepan, whisking to combine. Remove from the heat. Whisk in the rhubarb compote. Cover and cool completely to room temperature, then refrigerate until completely cold. Fish the vanilla bean out of the rhubarb gelato mixture, then pour the custard through a fine mesh strainer into the bowl of an ice cream maker (straining the mixture will ensure a silky smooth gelato). Freeze according to the manufacturer’s instructions. Stop the machine when the gelato is icy but still soft. Color Note: To achieve a blush pink color, you need to select the "pinkest" parts of rhubarb stalks. If using whole stalks, the pink color might be more shy, but you can help it by adding a drop or two of pink food coloring.